PORTEmaus: Somebody Should Educate This Lass on Canine Treak or Treaters... Happy Halloween. Somebody Should Educate This Lass on Canine Treak or Treaters... Happy Halloween. Avast, foul beasts! Get thine muzzle out of mine bag of confections lest you want death or our your innards rendered asunder! Today is Halloween and a blessed day it is for filling one's belly full of candy. Although, I am a little perplexed by the multi-layered costumes of these blokes. Seriously, you are already in a dog costume, what is the need for the convict, Superman or pirate costume? I must say those dog costumes are quite realistic... Wait? 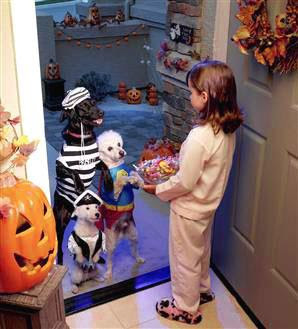 Those are dogs in costume... What is all this shenanigans stealing candy from the children and what is the deal with the kid with the candy bucket? Looks like someone is paying the price for putting a tack on Ms. Johnson's stool in geometry... Poor lass. Let the pumpkins be carved and the innards made in (oh so) delicious pumpkin bread. 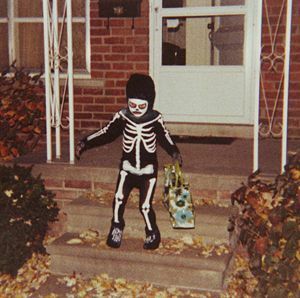 May the children go door to door begging for the treats that shall rot their teeth. As seen with Bence's post, we here at PORTEmaus enjoy Halloween mostly because of our wee bairns (and it is Lady Funkowitz's favorite holiday) but for the most part, we love sweet sweet candy. All in all, we hope that you have a fantastic Halloween and you should avoid any candy that does not come from a store (we're looking at you, candy apples) or is generic (cheap candy gets an egg to the door, gramps). From all of us here at PORTEmaus, have a safe and fun Halloween. For those visiting the Funkowitz household, we do not believe in generic candy, so do not egg us please.